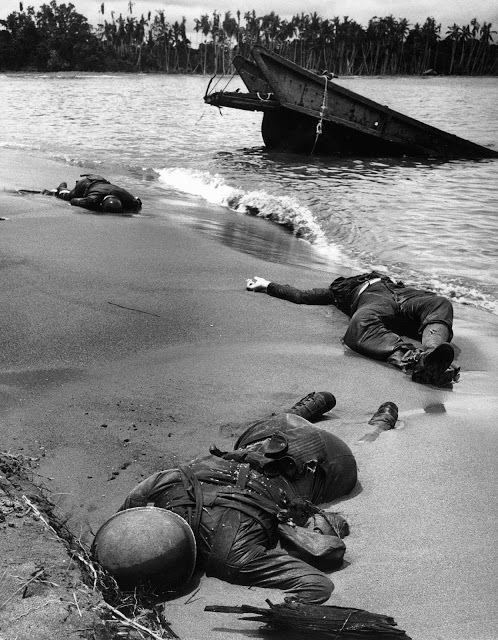 LIFE photojournalist George Strock captured an iconic image of 3 U.S. soldiers lying on the sand of Buna Beach, New Guinea. The small wave breaking provides a stark contrast to the stillness of the men and the half-submerged landing craft behind them. As the Office of War Information has a strict policy about images of the dead being dispatched by the media, LIFE Washington correspondent Cal Whipple argues the case to publish Strock’s photograph. The battle of censorship would escalate from an army captain all the way to U.S. President Franklin D. Roosevelt, who finally gave the approval for its publication. The photo would finally be published on the September 20, 1943 edition of LIFE magazine. The powerful effect of the image would help to steel American resolve in the war effort, as well as earning the distinction of being the first image of dead American troops to appear in the media during World War II. Here lie three Americans [the editorial began]. What shall we say of them? Shall we say that this is a noble sight? Shall we say that this is a fine thing, that they should give their lives for their country? Or shall we say that this is too horrible to look at? Why print this picture, anyway, of three American boys dead upon an alien shore? Is it to hurt people? To be morbid? Those are not the reasons. The reason is that words are never enough. The eye sees. The mind knows. The heart feels. But the words do not exist to make us see, or know, or feel what it is like, what actually happens. The words are never right. . . . The reason we print it now is that, last week, President Roosevelt and [Director of the Office of War Information] Elmer Davis and the War Department decided that the American people ought to be able to see their own boys as they fall in battle; to come directly and without words into the presence of their own dead. And so here it is. This is the reality that lies behind the names that come to rest at last on monuments in the leafy squares of busy American towns.